On January 4, 2011, Salmaan Taseer was assassinated in Islamabad by his security guard, Malik Mumtaz Hussain Qadri, who disagreed with Taseer’s opposition to Pakistan’s blasphemy law. Taseer had publicly defended a Christian woman who was accused of blasphemy against Islam. His bodyguard killed him for this. Muslims protested for Qadri’s release after his arrest. 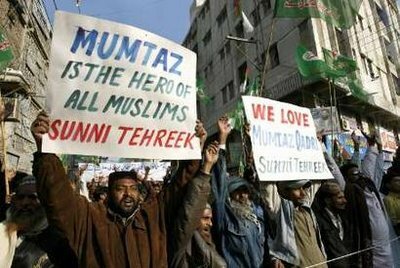 Muslim supporters of the Sunni Tehreek religious party hold placards in support for Malik Mumtaz Hussain Qadri, the gunmen detained for the killing of Punjab Governor Salman Taseer, in Hyderabad January 9, 2011. This week Pakistani officials hung Mumtaz Qadri for assassinating the moderate governor. TENS OF THOUSANDS of Muslim supporters attended Qadri’s funeral today in Rawalpindi. An estimated ONE MILLION MUSLIMS attended the funeral today.